Within three years of the Death Star's demise, the Galactic Empire again proved its evil nature with the construction of a second Death Star in a remote region of space. Fortunately for the galaxy, the Empire never completed this monstrosity. Word of its construction was spread through the Rebel ranks by Bothan spies. The Alliance was able to pinpoint the exact location of Death Star's construction, and mount a pre-emptive strike to destroy the station. The leaked information was all a ruse. The scheming Emperor Palpatine engineered the Rebellion's discovery of the Death Star in the hopes of trapping the growing Rebel fleet. The second Death Star would not be as vulnerable as the Rebels believed. To ensure that the Death Star would destroy the lured Alliance fleet, Palpatine entrusted the supervision of its final phase of construction to his Sith apprentice, Lord Darth Vader. Vader motivated the Death Star's commander, Moff Jerjerrod, to see that the battle station was operational when the Emperor arrived for his inspection tour. 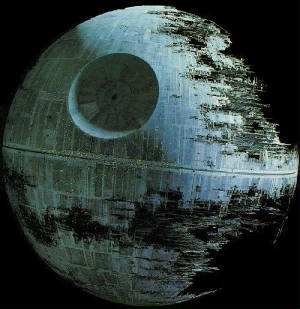 The second Death Star was not a complete sphere. Though much of the battle station's recognizable shape was visible, there were huge sections of exposed superstructure and visible skeleton. To protect the half-completed and immobile station during its construction, the Empire projected an immense deflector shield from the nearby forest moon of Endor. The shield was strong enough to protect any breach from both capital and starfighter-class ships. The Alliance sent a commando team to land on the moon and deactivate the shield generator while the Rebel fleet emerged from hyperspace to destroy the station. Unlike the previous Death Star, whose reactor core was accessible only from a two-meter wide exhaust port, the second Death Star's heart had to be destroyed by actually flying into the superstructure and detonating the collosal power plant. The commando team was waylaid by Imperials and the Rebel fleet arrived to find the deflector shield intact. Worse yet, the superlaser was operational, and began destroying Rebel Mon Calamari cruisers with each blast. General Lando Calrissian came up with a daring and foolhardy tactic to engage the Imperial fleet at point-blank range, thus limiting the Death Star's available targets. Aided by the native Ewoks of Endor, the Rebels were able to infiltrate and destroy the shield generator complex. With the shield down, General Calrissian led the Alliance starfighters into the inner recesses of the Death Star. There, he and Wedge Antilles loosed a volley of ordnance that began an immense fireball that tore apart the station. Emperor Palpatine's body was consumed in the explosion. The Imperial fleet never recovered from the fiasco. What was to be the Rebel Alliance's demise instead turned into the death of the Empire. As firey fragments of the battle station burned away in Endor's atmosphere, the celebratory cheers of freedom rang throughout the forests, and indeed, the entire galaxy. He wasn't always a fearsome enforcer, however. He began life as Anakin Skywalker, a young slave from Tatooine skilled in piloting and strong in the Force. Once discovered by maverick Jedi Master Qui-Gon Jinn, Anakin was taken before the Jedi Council to be trained. There was some controversy on the subject -- despite Jinn's adamant assurances that Skywalker was the chosen one spoken of in an ancient Jedi prophecy, the council was hesitant to allow his training at the age of nine. Finally, the council agreed that Anakin should be trained, and he was assigned to Jedi Knight Obi-Wan Kenobi. Kenobi recklessly thought that he could be as skillful a master as Yoda. His mistakes had dire consequences for the galaxy. Skywalker was seduced by the dark side of the Force. Fueled by rage and discontent with the pace of Obi-Wan's training, Anakin challenged his master to a duel. Despite newfound power bestowed by the dark side of the Force, which added to his already formidable abilities, Anakin was grievously wounded in the fight. His burning anger kept him alive, and he was forever scarred not only by his wounds but also by betrayal. He abandoned his former identity. When metal coupled with flesh in the form of cyborg implants and enhancements required to sustain him, Skywalker's transformation was complete. He was no longer Anakin. He was Darth Vader. At the time of his transformation, Vader never knew he was due to be the father of twins. Obi-Wan Kenobi hid the children from the Dark Lord and Vader's master, Emperor Palpatine. Vader somehow discovered that he had a son, Luke Skywalker, but never suspected he had a daughter, Leia, who was secretly taken to be raised by Bail Organa, Viceroy and First Chairman of Alderaan. In the chaos that accompanied Palpatine's rise to power, Vader became one of the Emperor's most loyal servants. The Emperor entrusted him with the elimination of the Jedi Knights. During these dark times, Vader and his agents destroyed the Jedi order. When the Galactic Civil War raged across the Empire, Darth Vader was tasked with discovering the location of the Rebel Alliance's secret base. Vader captured Rebel operative Princess Leia Organa and had her tortured to reveal the location of the hidden fortress. Vader also sought technical plans stolen by the Rebels. These plans carried the complete schematics of the Empire's most powerful weapon, the Death Star battle station. When a rescue team successfully liberated the princess, Vader found himself face to face with his former master, Obi-Wan Kenobi. Vader defeated the aged Jedi Knight in a lightsaber duel. Using the stolen plans to pinpoint the Death Star's weakness, Rebel forces launched a starfighter attack on the station. Entering the battle, Vader piloted his own specially modified fighter. He managed to destroy the most Rebel pilots in the battle, but was forced out of the conflict when his own vessel was crippled by the Millennium Falcon. Three years after the destruction of the Death Star, Vader led an elite squadron of Star Destroyers headed by his flagship, the Super Star Destroyer Executor. He was to seek out and capture the Rebels responsible for the Death Star's demise. Eventually, Vader tracked the Rebels down to the ice-world of Hoth. There, he launched a ground attack destroying the base. His quarry, the Millennium Falcon, escaped. During the Hoth campaign, the Emperor commanded Vader to track down the "son of Skywalker," and have Vader turn him to the dark side of the Force. Vader planned to use Skywalker's friends as bait to lure him into a trap. He hired a motley gang of bounty hunters to track down the Falcon, and drew Luke to Bespin's Cloud City. He and Luke clashed in a lightsaber duel that Vader won by ruthlessly severing Luke's sword-hand. Vader then revealed to the broken young Jedi that he was his father, and that they would rule the galaxy as father and son. Luke refused to succumb to the dark side, and escaped his father. Vader was left empty-handed. After these incidents, Palpatine reassigned Vader from the Imperial fleet, and instead put him in charge of overseeing the new Death Star operation. The Emperor began to distrust his once loyal servant. Vader's contact with his son sparked something within him, something the Emperor did not like. Palpatine was scheduled to arrive at the second Death Star. The Emperor foresaw that Skywalker would come before the two, and then they would seduce young Luke to the dark side, just as Anakin had been drawn to its power decades earlier. When Luke surrendered, and was taken before the Emperor, Palpatine pitted father and son in a lightsaber duel. Skywalker refused to fight and give into the temptation of the dark side. Vader, probing his mind, learned of his daughter, Leia Organa. He threatened to turn her to the dark side. At this threat, Luke gave into his hatred and attacked his father. In the ferocious assault that followed, young Skywalker nearly killed Vader. Horrified by what he had become, Luke abandoned his new found dark side rage, and refused Palpatine's offers of power. "I am a Jedi, like my father before me," Skywalker proudly claimed. Palpatine unleashed a deadly barrage of dark side energy on the young Jedi. Lightning bolts spawned from pure evil tore into Luke's body with searing pain. Vader stood helplessly, watching his son writhe in agony from torture delivered by his master. Unable to watch anymore, Vader turned against his master. He grabbed a surprised Palpatine from behind, hoisted him above his head, and tossed his evil master down a bottomless reactor shaft. 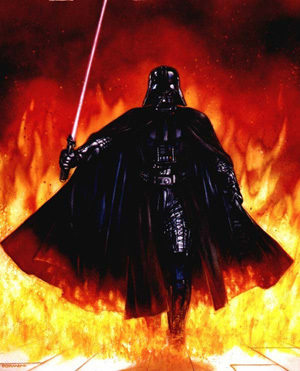 Vader was bombarded by the Emperor's Force lightning, mortally wounding him. As he lay dying, Vader ceased to be. Anakin Skywalker returned. He asked his son to remove the cumbersome, fearsome mask that had concealed his face for decades. His mask and life support removed, Anakin looked upon Luke for the first and last time. He then died, his body disappearing into the light side of the Force. A legendary starship despite its humble origins and deceptively dilapidated exterior, the Millennium Falcon has factored into some of the Rebel Alliance's greatest victories over the Empire. On the surface, the Falcon looks like any other Corellian freighter, with a saucer-shaped primary hull, a pair of forward cargo-gripping mandibles, and a cylindrical cockpit mounted to the ship's side. 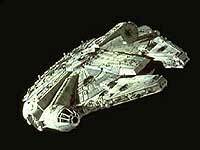 Beneath its hull, though, the Falcon packs many powerful secrets. Its owners made "special modifications" on the freighter, boosting its speed, shielding and performance to downright illegal levels. Its weaponry has been upgraded to military-class quad laser turrets. To cover rapid escapes, the Falcon sports a ventrally mounted hatch-concealed antipersonnel repeating laser. Between its forward mandibles rest concussion missile launchers. The habitable interior of the vessel also has a few surprises, such as concealed scanner-proof smuggling compartments. Palpatine was the supreme ruler of the most powerful tyrannical regime the galaxy had ever witnessed, yet his roots seem extremely humble, traced back to the peaceful world of Naboo. Before his rise to power, Palpatine was an unassuming yet ambitious Senator in the Galactic Republic. Palpatine saw the Republic crumbling about him, torn apart by partisan bickering and corruption. All too common were those unscrupulous Senators taking advantage of the system, growing fat and wealthy on a bureaucracy too slow to catch them. Palpatine's moment of opportunity came as a result of a trade embargo. The Trade Federation, in protest of government measures that would tax their outlying trade routes, blockaded and invaded Naboo. Naboo's planetary leader, Queen Amidala, rushed to Coruscant for Palpatine's aid. Together, the two pleaded to the Senate for intervention, only to see their request stalemated by Trade Federation filibustering. Frustrated by the government's inability to do anything, Queen Amidala acted upon Palpatine's suggestion, and called for a Vote of No Confidence in the Republic's leadership. Chancellor Valorum was voted out of office, and Palpatine was soon nominated to succeed him. The crisis on Naboo prompted a strong sympathy vote, and Palpatine became Chancellor. He promised to reunite the disaffected, and bring order and justice to the government. 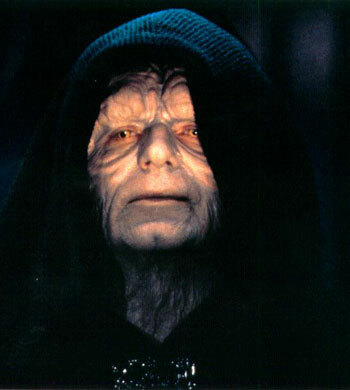 Little did anyone suspect how Palpatine had engineered his own rise to power. Hidden beneath a façade of wan smiles and smooth political speeches was a Sith Lord. In truth, Palpatine was well versed in the ways of the Force, having been apprentice to Darth Plagueis the Wise, a Sith Lord who was a master of arcane and unnatural knowledge. In true Sith tradition, Palpatine murdered his Master upon achieving the skill and ability to do so. He then took an apprentice himself, continuing the Sith order in absolute secrecy, right under the noses of the Republic and the Jedi. With his cloaked Sith identity of Darth Sidious, Palpatine made contact with the scheming Neimoidians and plotted the invasion of his own homeworld. The resulting political fallout allowed Palpatine to step into the power vacuum left by Chancellor Valorum. Despite Palpatine's vocal promises of reform, the Republic continued to be mired in strife and chaos. A decade after his nomination, Palpatine's Chancellery was faced with the challenge of a popular Separatist movement led by the charismatic leader, Count Dooku. Many in the galaxy feared that the conflict would escalate to full-scale warfare, but Palpatine was adamant that the crisis could be resolved by negotiation. The Separatists didn't agree. Upon the discovery of a secret army of droids, it became apparent that the Separatists were on the verge of declaring war against the Republic. To counter this, the Republic needed a military, and Palpatine required the authority to activate the Republic's newly forged army of clones. To that end, Senators loyal to Palpatine motioned that the Chancellor be given emergency powers to deal with the Separatist threat. With spoken regrets, Palpatine accepted the new mantle of power. He promised to return his absolute authority to the Senate after the emergency subsided. What no one realized was that the galaxy would undergo further upheaval, and that a state of crisis would ensure Palpatine's authority for decades. The Clone Wars were just part of an intricate Sith plan concocted by Palpatine. After the demise of Darth Maul, he needed a new apprentice to carry forward his agenda. He did not have time to train an adept from the cradle, but instead plotted to turn an already proven Jedi warrior onto the path of the dark side. His target, the disillusioned Jedi Master Count Dooku. By appealing to Dooku's civility and disgust with Republic corruption, Palpatine was able to lure him to the dark side. When he became fully enmeshed in the Sith order and pledged his absolute loyalty to Palpatine, Dooku was granted the mantle of Darth Tyranus. As Tyranus, Dooku put into motion the next phase of Sidious' fiendish plot. He was responsible for the creation of a clone army on the Republic's behalf, selecting a prime candidate as the clone template: Jango Fett. With his public persona of Dooku, he grew to become a political firebrand, leading a militant band of dissidents to wage open war against the Republic: a war the Republic was pleasantly surprised to find they were equipped to fight. The Clone Wars were a sham -- as Palpatine secretly held authority over both sides of the conflict. The indications of his future regime were subtle at first. Palpatine's term as Chancellor ended during the rise of the Separatists, but that crisis allowed him to extend his stay in office. Once the Clone Wars erupted, the Senate's inability to efficiently wage war on scattered fronts forced him to enact executive decree after executive decree. He added amendments to the constitution funneling more power to him, effectively circumventing the bureaucracy of the Senate. The public and the Senate willingly gave up their rights and freedoms in the name of security. Under Palpatine's guidance, the war would be won, and the Republic would be safe. The monstrous specter of General Grievous leading an assault ensured that few questioned Palpatine's growing authority. The Jedi Council was among the wary. As an instrument of the Senate and the people, the Jedi order resisted Palpatine's directcontrol. This tension grew as the war escalated. Some in the Senate also quietly whispered their misgiving. Palpatine knew of a delegation of concerned Senators, and he would deal with them in time. During the Clone Wars, Anakin Skywalker grew to be legendary hero among the Jedi. His power was remarkable. Palpatine, who had been fostering a friendship with the unique lad since his childhood, felt the time was right. Darth Tyranus had served his purpose. Skywalker would be the next Sith apprentice. As a bold endgame to his lengthy plot, Palpatine was architect of his own abduction by the fearsome General Grievous, military commander of the Separatist forces. The Confederacy fleet hammered Coruscant's defenses, and absconded with the captive Chancellor. Predictably, the Jedi order's finest heroes -- Anakin Skywalker and Obi-Wan Kenobi -- were dispatched to rescue Palpatine. Aboard their tiny starfighters they infiltrated Grievous' flagship, and worked their way to the shackled Chancellor. Count Dooku stood in their path. Once again, lightsaber blades crossed as Kenobi and Skywalker teamed up against Dooku. The aged Sith Lord was able to outmaneuver Kenobi, and knocked the seasoned Jedi unconscious. Without his mentor's guidance, Anakin attacked Dooku alone. The Sith Lord goaded Anakin's rage, and the young Jedi took revenge against the warrior who had severed his arm years before. Skywalker cut off both of Dooku's hands, and had the Separatist leader kneeling before his lightsaber blade. Palpatine recognized the dark side in Anakin and nurtured it. He encouraged Anakin to kill Dooku. Skywalker's blade seared through flesh and bone, and Dooku's severed head soon littered the deck. Though Anakin instantly regretted the act for not being of the Jedi way, Palpatine was quick to console him, and absolve him of any guilt. After all, Dooku was too dangerous to be taken alive, rationalized Palpatine. It was not the first time Palpatine had encouraged Anakin's unfettered abilities. A young man of Anakin's abilities was constantly chafing under the strict confines of the Jedi Code, and was often being reprimanded for doing what he felt was right. Palpatine never had any admonitions. He was always in Anakin's corner. Skywalker would remember this as the political fallout from Dooku's death and the continued Clone Wars tugged him in different directions. The Jedi Council had grown wary of Palpatine, and was critical the Chancellor's decrees that redirected power away from the Senate and the constitution and into his office. Palpatine grew to naturally distrust the Council. He appointed Anakin Skywalker to act as his personal representative on the Jedi Council. Surprisingly, the Jedi Council agreed to this appointment -- but only in the hopes of turning Anakin into their spy on the Chancellor. Palpatine exploited this distrust and confusion plaguing Anakin. Skywalker grew to feel that the Chancellor was the only one not asking something of him, the only one not speaking through veiled agendas. It was in this position of trust that Palpatine recounted a Sith legend -- the story of Darth Plagueis the Wise. In the relative privacy of his viewing box in the Galaxies Opera House, Palpatine wistfully recalled the little heard legend of the powerful Sith Lord so knowledgeable in the arcane and unnatural arts that he could even stop those he loved from dying.At the time, Anakin Skywalker was plagued with visions of the death of his wife. He feared them to be prophetic, like so many of his visions. Skywalker wanted to know more about this ability -- it was unknown to the Jedi, supposedly only discovered by the Sith. Knowing that he had the boy sufficiently intrigued, Palpatine later dropped his guise. He revealed to Anakin that he was in fact a Sith Lord, but also that he was the path to the power that could save Padmé Amidala from dying. Anakin was deeply conflicted. Respecting his loyalty to the Jedi Order, he informed senior Jedi Council member Mace Windu of the stunning revelation. Windu arranged a group of Jedi Masters to arrest the Chancellor. Palpatine did not go quietly. In the inner recesses of the Chancellor's private office, the Jedi confronted the Chancellor. Palpatine produced a lightsaber hidden in his sleeve and let the dark side of the Force flow through him. It granted him inhuman dexterity and speed, agility enough to quickly kill three Jedi Masters and force the mighty Mace Windu back. The two dueled, transforming the office of politics into an arena of lightsaber combat. Windu overpowered Palpatine the instant Anakin Skywalker came running into the offices. Skywalker witnessed a stunning sight: the Chancellor, cornered, with Windu looming over him with his lightsaber blade extended. Palpatine unleashed a torrent of Sith lightning at the Jedi Master, but Windu was able to deflect it back at the Chancellor. The evil energies twisted Palpatine's face as they flowed through him, scarring and disfiguring his once handsome features. 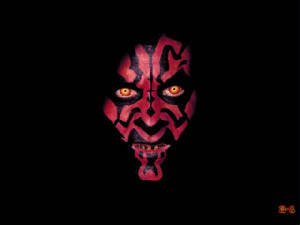 His eyes burned yellow, his voice grew ragged and deep, and he became a well of dark side energies. Palpatine slumped in his cornered, seemingly too weak to continue the lightning assault. Fearing the Chancellor to be too powerful and too well connected, Windu decided he could not be taken alive. Before Windu could take justice into his own hands, though, Anakin sprung into action. He cut off Windu's weapon hand with his lightsaber. Defenseless, Windu was then bombarded by Palpatine's dark side lightning. With the Jedi Master dead and Anakin Skywalker haven taken his first irreversible step to the dark side, Sidious grinned. Skywalker knelt before Darth Sidious, and the Sith Lord bestowed upon him the title of Darth Vader. He next tasked his new apprentice to raze the Jedi Temple before the treacherous Jedi could strike back at them. Entrenched in the dark side, Vader marched to the temple with a column of loyal clone troopers, gutting the sacred edifice from within. Meanwhile, Sidious took care of the Jedi scattered across the galaxy waging the Clone Wars. Palpatine enacted Order 66, a coded command that identified the Jedi Knights as traitors to the Republic. He broadcast this order to the clone commanders on the various distant battlefronts, and the loyal soldiers killed their Jedi generals in cold blood. The next day Palpatine called for a special session of the Galactic Senate. Despite his disfigurement, he appeared before the assembled politicians of the Republic, and gave a stirring speech of how he narrowly escaped a treacherous Jedi rebellion. He assured the people of the Republic that his resolve had not faltered. He had routed out the treachery that had entangled the Republic in the Clone Wars. He would flense the corruption from the bloated bureaucracy that strangled the august government and reform it, as a new, more powerful, more secure institution. That day, before thunderous applause, Palpatine declared himself Emperor. Palpatine instituted a military build-up unprecedented in galactic history. He created the New Order, a Galactic Empire that ruled by tyranny. During the Galactic Civil War, Palpatine ruled with an iron fist. He disbanded the Imperial Senate, and passed control down to the regional governors and the military. During the Hoth campaign, Palpatine expressed to Vader his concerns over Luke Skywalker, a young Rebel powerful in the Force. Vader suggested that the two convert the youth to the dark side of the Force, an idea the Emperor seconded. The Emperor was a scheming ruler, planning events far in the future, using the Force to foresee the results. Palpatine allowed Rebel spies to learn of the location of the second Death Star, and foresaw their strike team and fleet assault. Palpatine crafted an elaborate trap that was to be the end of the Rebellion. He also concentrated on converting Luke Skywalker to the dark side of the Force, even at the expense of sacrificing Vader. In the Death Star, high above the Battle of Endor, Luke refused the Emperor's newfound dark side power, and so Palpatine used his deadly Force lightning to attack the young Jedi. Luke almost died in the assault, but his father, Darth Vader, returned to the light side of the Force, and hurled the Emperor into the Death Star's reactor core, killing him. Palpatine was a gnarled, old man. An ancient-looking human, he had pale skin, and searing, sickly yellow eyes. He wore a heavy dark cloak, and carried a glossy black cane.